Prominent & Leading Manufacturer from Mumbai, we offer dowty seal. 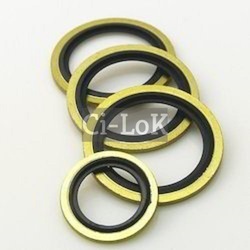 Hydraulic Dowty Seals is face type seal Comprising flexible rubber lips within a steel ring. The application when used the primary action deflection of rubber lips. The tightening and bursting loads are resisted by metalring. This steel ring is given an anti corrosive treatment which prevents from rusting. The rubber used is oil resistant nitrite compound (JSR).